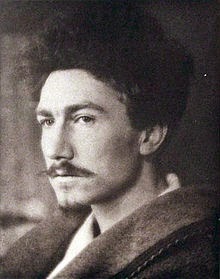 Brittany's Blog of Random Things: Ezra Pound's "Francesca"
I wanted to start the weekend off with a poem containing strong images. I’ve read this poem many times and yet each successive reading feels like I’m reading it fresh. The lines “dry as a dead leaf,/ Or as a dandelion seed-pod and be swept away” are so specific but elegant that they allow me to form an image in my mind of the world drying and crumbling as an autumn leaf. In this poem, Pound leaves enough to the reader’s imagination and leads just enough to guide us to the end with simple straightforward language. Maybe that’s why this is one of the few poems that I like from him. Of all of his works, this is the only one that sticks with me, the only one that I feel close to. Many of his other poems feel to me like a science classroom readying to dissect a frog. Everyone wants to do it, but at the same time no one wants to do it. Pound is one of the most famous poets, so as a student of poetry, I should read and love his poetry. So like a good student, I read his poems, but each new one read brought new disappointment until it was like dissecting a frog. I wanted to read more so I could learn why everyone loves his poetry and so I could learn from his technique, but reading his poetry was like a chore, something I didn't want to do. It turned into something I found revolting. However, one day I stumbled upon "Francesca" and it's simple but beautiful message of love and possession captured my interest. And from this discovery, I realized that every poet, even if my tastes and style don't align with theirs, have at least one work or poem that redeams them. I love it when poets surprise me. I hope everyone is enjoying Good Friday. I have today off and my husband and I are taking our three day weekend in Washington DC. Smithsonian, Whitehouse, and Library of Congress here we come!!! !